NASHVILLE—What if instead of lining up for a flu shot of unknown effectiveness each fall, people could receive one vaccine that protects against all strains and lasts for many years, if not for life. It could spare incalculable amounts of suffering, and even eliminate terrifying pandemics. Scientists have spent decades trying to concoct such a “universal” flu vaccine and, at times, they seem to have made solid headway. But it remains an “alchemist’s dream,” as one virologist declared last month at a gathering on the topic organized by the Human Vaccines Project, a nonprofit based in New York City. An infusion of funding has boosted the research: $160 million next year from the National Institute of Allergy and Infectious Diseases (NIAID) in Bethesda, Maryland, up from $60 million 2 years ago. But the effort is an exercise in humility, several leading flu researchers acknowledged at the meeting. “Every year we learn that we know less and less about this virus,” says Martin Friede, a biochemist who coordinates the Initiative for Vaccine Research at the World Health Organization in Geneva, Switzerland. Each year vaccinemakers concoct a new preparation that contains harmless versions of flu strains in circulation the previous year. These seasonal vaccines have a mediocre efficacy of 20% to 60%, in part because the vaccine is often a poor match for the virus people actually contract ( Science , 22 September 2017, p. 1222). Other, less obvious factors highlighted at the meeting also influence the response to the seasonal vaccine, including the immune system’s memory of past exposure to viral variants. In theory, a universal flu vaccine would work if it contained parts of the virus that remained the same from year to year, the so-called conserved epitopes that make the pathogen less viable if they change. But no one has yet found the viral pieces capable of stimulating an immune response that stops most flu viruses afflicting humans. Seasonal vaccines aim to trigger the immune system to make antibodies against the top part of hemagglutinin, one of two main proteins on the surface of influenza viruses. Several candidate universal vaccines focus instead on the “stem” of the mushroom-shaped protein because it has many epitopes that differ little between subtypes of the virus. But so far, clinical trials with vaccines that feature this portion have underwhelmed researchers. “Stem antibodies as a class are not very potent,” says James Crowe, an immunologist at Vanderbilt University here who helped organize the meeting. 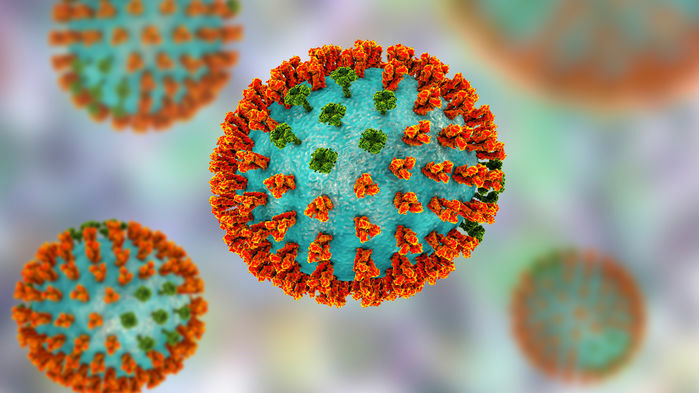 David Morens, a pediatrician at NIAID, noted that many studies have found that antibody levels to the virus’s second surface protein, neuraminidase, better correlate with protection from disease. Improving seasonal vaccines by selecting those that best trigger neuraminidase antibody production is “potentially low-hanging fruit,” Morens says. This might also help improve the potency of potential universal vaccines. Designers of a universal flu vaccine face another quandary, speakers at the meeting noted: an immune phenomenon called imprinting. The first influenza virus or flu vaccine children experience has a profound impact on the breadth and potency of their immune responses to subsequent infections to different flu strains. For example, the infamous 1918 influenza pandemic, which likely killed more than 100 million people, was caused by a virus subtype known as H1N1. (“H” is for hemagglutinin and “N” is for neuraminidase.) Oddly, there was tremendous excess mortality in populations of young adults, who typically have the least death from influenza. Studies found this was because exposure to H1N1 triggered strong antibody responses to a virus of a different subtype—likely H3N8—that they had seen as children a few decades before. “Tickle [the memory B cells] a little bit and they explode,” says Scott Hensley, a molecular biologist at the University of Pennsylvania’s Perelman School of Medicine. “And they dominate subsequent immune responses,” causing the response to a new virus to miss its mark. To learn more about what some call “original antigenic sin,” NIAID is evaluating proposals for a study that would follow infants for up to 7 years to track how their initial influenza exposure impacts later immune responses. In the meantime, Hensley suggests the first flu vaccine children receive be packed with many versions of common human subtypes, a possible step toward a universal vaccine because it should offer much broader protection than seasonal ones. Meeting presenters also described how sophisticated computer programs can help guide vaccine design. Ted Ross of the University of Georgia in Athens explained how his group scans the DNA encoding hemagglutinin’s head for conserved sequences that they can then combine into a universal vaccine. Crowe’s lab instead is using a supercomputing technique—it predicts 3D structures from amino acids—that analyzes the shape of billions of antibodies to select ones calculated to have the broadest reach; ultimately, they hope to reverse engineer proteins that, used in a vaccine, would trigger these antibodies. Lisa Wagar, an immunologist at Stanford University in Palo Alto, California, has created a new testbed for vaccine researchers. Instead of monitoring the immune response in blood, she aims to simulate the first immune defenses an invading virus will meet, in the respiratory tract. She has used tonsils, which are rich in mucosal tissue, taken from children to grow tonsillike “organoids” that can help evaluate experimental influenza vaccines. A handful of universal flu vaccines are now being tested in early human trials. Each one exploits conserved regions of the virus to maximize breadth, and some also attempt to increase potency with immune system stimulants called adjuvants and other strategies. At the gathering’s closing, Wayne Koff, who heads the Human Vaccines Project, said it was “sobering” that if a universal flu vaccine meeting had been held in the 1960s it would have discussed the same obstacles. “We are really at the beginning of the dance,” Koff said.